NOTICE: Since I am disabled, sometimes I am offline. Please don't expect a speedy response to your comments. If you need immediate help, please call the hotline or reach out to somebody you trust. On National Suicide Prevention Day last week, many Twitter celebrities did their civic duty by retweeting the same two tweets over & over again, both pointing to suicide prevention hotlines. Some people who discuss suicide the other 364 days of the year were irritated by the superficial emphasis on hotlines—as if tweeting a hotline constituted quality support. Certainly, Twitter can be vapid. Twitter advocacy is usually about feeling charitable more than actually being charitable. But were suicide prevention hotlines as bad as people claimed? I generally considered a hotline the last option because there are so many other better, more personable, resources out there, but common consent on Twitter was that these hotlines were terrible things best avoided like the hantavirus. Some people expressed fear that conversations were recorded and traced. Some even claimed that their experience with a hotline was demeaning when they were questioned for demographic information. Could it be true? I found out that many of the fears people have were mislaid, and that a suicide prevention hotline was far more useful than I realized. I had called a hotline before when I explored asking Apple’s Siri to get suicide help and had a very positive experience, so I thought I’d call and ask them to address people’s concerns. Then I called them again a few days later when I was feeling down to see what would happen. Here’s what I learned. 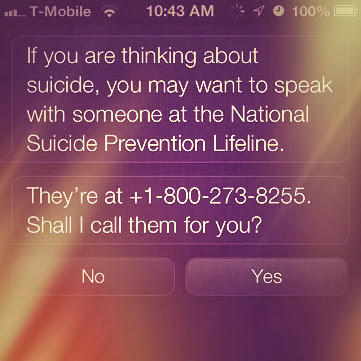 If you use Siri you will get the phone number for the National Suicide Prevention Lifeline (1–800–273–8255). This number routs you to a local call center. Since I live in the Salt Lake Valley in Utah, I was directed to a local call center at the University of Utah. The people at the Suicide Prevention Resource Center (SPRC) were friendly, supportive, and eager to help. They don’t believe in a stigma surrounding suicidal ideation and want to make themselves available for anybody who is struggling. Funding has made overnight stays available for people in crisis, with counselors on site to help out. There is even a mobile unit that can travel to you. Funding is also available for longer stays for those who qualify (depending on the severity of your situation). The SPRC doesn’t record conversations, but they do involve the police to trace calls from time to time when the caller is in danger of self-harm. This is not a common occurrence, however. Their policy is to first attempt to get permission from the caller before sending help. As for demographic questionnaires, I was not asked to provide demographic information. From what I have read online, centers like the SPRC need to know who in their community they are serving to help procure funding. If you feel uncomfortable answering personal questions, tell the phone counselor exactly that. It’s your phone call. Lastly, I wanted to see what type of support I would receive if I was depressed. A friendly voice told me their name and asked me how I was doing. I wasn’t pressed for any private, identifying details. The phone counselor simply let me talk. I told her I wasn’t suicidal, but I was depressed and was curious what type of support they offered. I have never needed a hotline because of my excellent support network, so I wasn't sure what to say. However, taking the step to reach out to somebody has always improved my mood, so I told the phone counselor that I felt better and hung up. The SPRC didn’t call back. There was no rescue unit outside my door. I simply had a very nice conversation with a supportive phone counselor who was there to help me if I needed it. If I had been suicidal as I have experienced from time to time in the past, I can imagine that having a sincere person to talk to at four in the morning would be a very valuable asset. My support network isn't nocturnal as I am. Here are some tips to use a suicide prevention hotline as a viable resource next time you struggle with suicidal ideation and urges. Call the suicide prevention hotline before you need it. Not all suicide prevention hotlines are created equal. Do your research. If you are concerned about being traced, call the hotline from a pay phone. Ask them about their policies on recording conversations & tracing calls. Sunglasses and overcoat are optional. Not everybody has a virtual assistant in their pocket willing to dial the suicide prevention hotline for them, so use an old school trick. Write the hotline numbers down on a piece of paper, and store them in your wallet or purse. If you feel your phone counselor is too bound by a script, use silence to get them off the script, or tell them their script is making you apprehensive. I realize how vulnerable you might feel in a situation where you are at the edge of suicidal ideation, but you aren’t under any obligation to answer any question that makes you feel uncomfortable. Try to remember that. You can always ask to speak to another phone counselor, or just hang up and call again later. The phone counselors are people, too. Many of them are volunteering their time to be supportive to those in need. They aren’t professionals so cut them some slack. They may be just as nervous as you are. Don’t carry this burden alone if making a simple phone call can put you in contact with people that care.